Symptoms of Bile Acid Diarrhoea can vary from person to person. There is often a long history of chronic diarrhoea often diagnosed as severe IBS with many people having symptoms for many years, with some in excess of 10 years. In addition, many people diagnosed with BAD report the negative impact it has had on their social life and ability to work which in some cases has led to loss of employment, limited ability to travel, social isolation and depression. Many also report intolerance to foods and have tried, for numerous years, multiple dietary changes to try to manage bloating and diarrhoeal symptoms such as gluten and lactose free, low FODMAP, low fibre, low residue and specific carbohydrate diets. 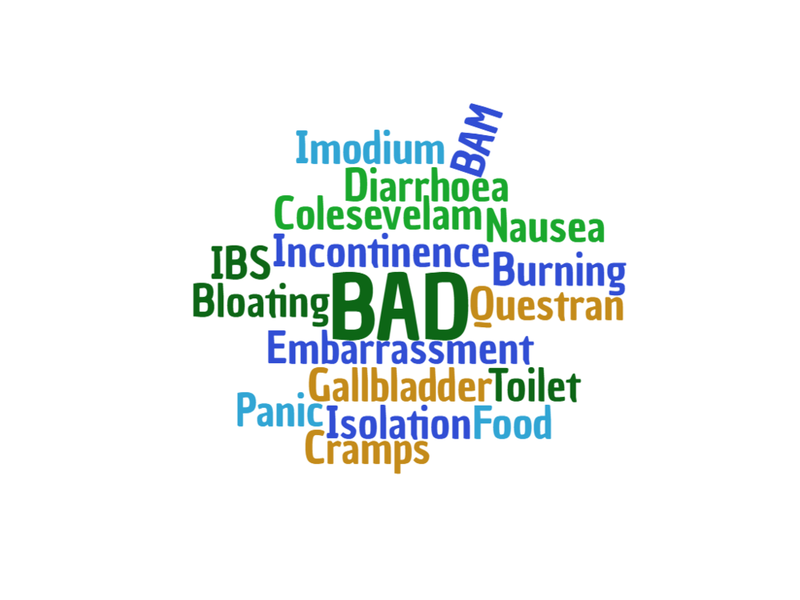 If you have had diarrhoea symptoms that have persisted for a long time and having read the information about BAD you think you may have it then it is advisable to see your GP. You may feel embarrassed about talking about your symptoms with your doctor but don't be. It is important that you are really open with your doctor and tell them exactly how it is otherwise they may not understand the seriousness of your symptoms. Initially, your GP or Consultant will need to undertake blood tests and provide a sample of your stool to see if there are any other causes for your diarrhoea such as inflammatory bowel conditions, coeliac disease, cancer or infections. Your GP may not have heard of BAD so do take information from this site to discuss with your GP as well as the website address for your GP to access the information themselves. It is also useful to take a log of your bowel motions and other symptoms with you to discuss with your GP. The Bristol Stool Chart is an excellent resource for monitoring your stool.